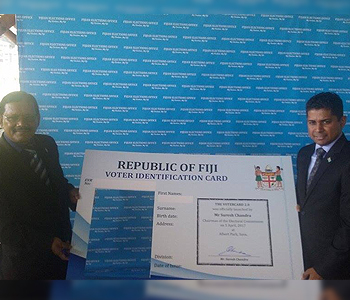 The Fijian Elections Office has today unveiled the new Voter Card 2.0 with enhanced security features for the 2018 general elections. Supervisor of Elections Mohammed Saneem says they reviewed the voter card features after the 2014 elections and have come up with an improved card with new features. The new card now has the date of issue of the card, has a unique design frame, contains the full printed website address and the office can track the number of times the card is replaced. Saneem clarifies that people can still use the old card for next year’s election. Today also marks an important day in the electoral calender for Fiji as we are now officially one year out from the first day the Writ for the Elections can be issued. Chairman of the Electoral Commission Suresh Chandra has chosen a theme for the 12 months that will follow and the theme is raising the standards in the delivery of elections in Fiji. Chandra says by every measure the multi national observer group deemed the 2014 general election credible and broadly representative of the will of the Fijian people. He says this should make the people of Fiji proud. Chandra says as technological advances come about, we should enhance the electoral process further. He says these are innovative ways to continue engaging the voters so that they have greater access to information than ever before.